Natural beauty that endures for years – with no assistance, no maintenance. The sighting and sorting is an art unto itself, arranging and attaching by hand. Always unique, signed by hand on the reverse. Made in Germany. 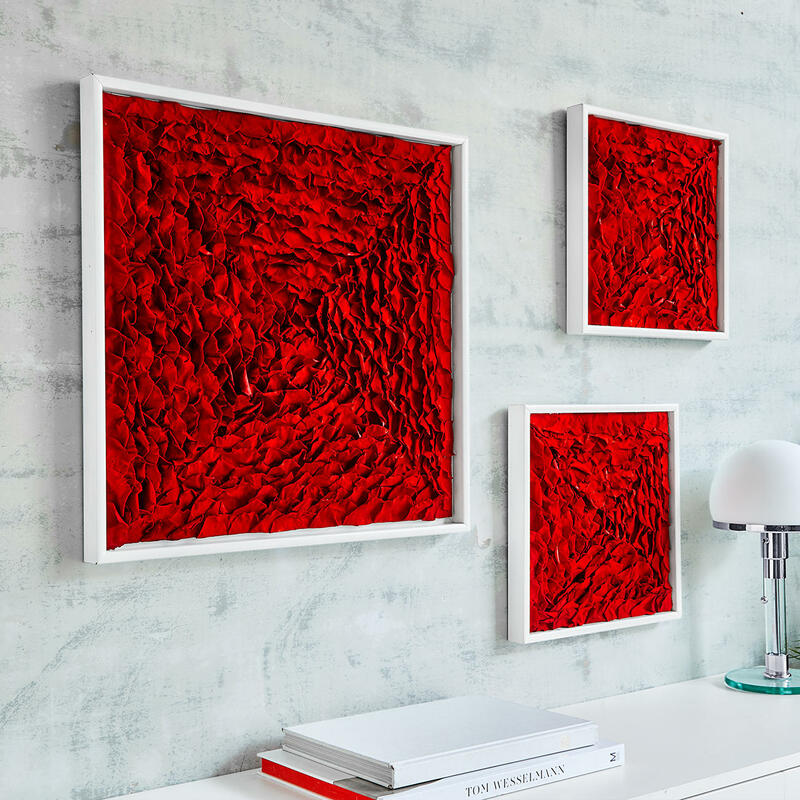 Complete with sophisticated shadow gap frame in gallery quality, made from white, lacquered spruce wood. Your choice of three sizes*. An eye-catcher in every atmosphere. Burst of flowers for years: Artfully composed by hand and comprising up to 2,500 genuine rose petals. Laboriously and ecologically preserved, the petals retain their natural colours for years. Arranged side by side by hand, the naturally grown petals form a three-dimensional collage. The hues all meld to the loveliest interplay of colours. 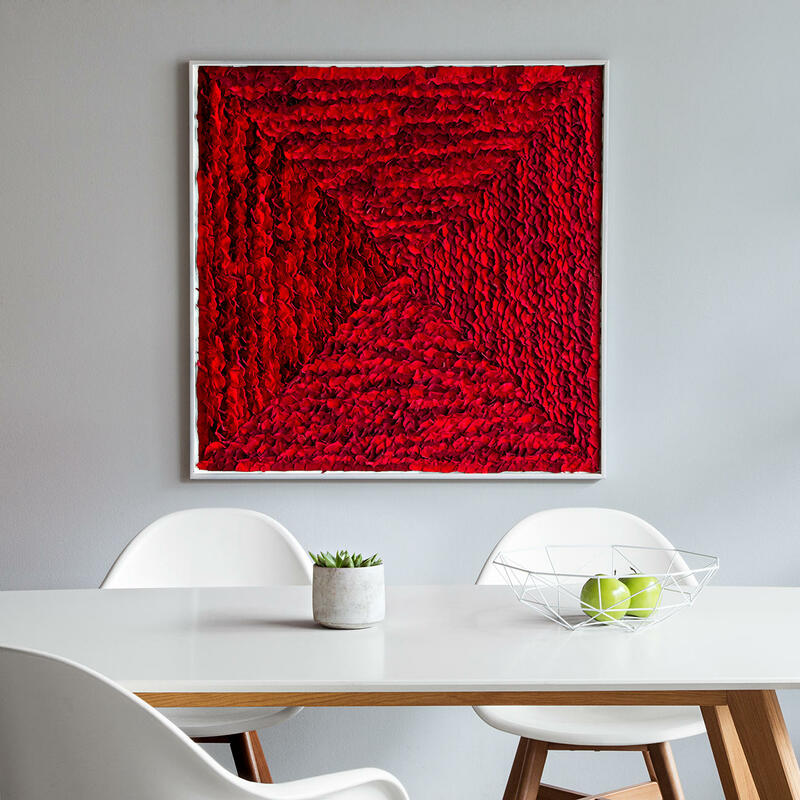 Two harmoniously balanced red tones create a living picture that never comes across as uneasy. Neatly assembled by hand according to colour and shape and securely adhered to the panel, the roughly 6cm (2.4") petals form a relief-like block structure. The suggested diagonals, which further accentuate the 3D effect, are only recognisable from further away. The colours and their arrangement are always individual. No two compositions are quite the same. You own a genuine unique piece, signed by the artist. No pane of glass to disrupt your view and the plastic structure can display unencumbered. Dimensions: 33 x 33 x 3.5cm (12.9" x 12.9" x 1.4"), approx. 200 petals. Weighs approx. 1kg (2.2 lbs). 53 x 53 x 3.5cm (20.8" x 20.8" x 1.4"), approx. 625 petals. Weighs approx 2kg (4.4 lbs). Large format, 100 x 100 x 3.5cm (39.3" x 39.3" x 1.4") and approx. 2,500 petals. Weighs approx. 5.2kg (11.5 lbs). (Depending on L x W x D.). Includes mounting. *On request, also available in other sizes. Please get in touch with our service team at 0844 846 50 50 or by email at info@proidee.co.uk.